I have never been on a cruise. I’m not into casinos, bingo, cheesy musicals, hypnotists, art auctions, or shopping in third-world tourist traps. Thus most cruise ships and itineraries don’t catch my fancy. 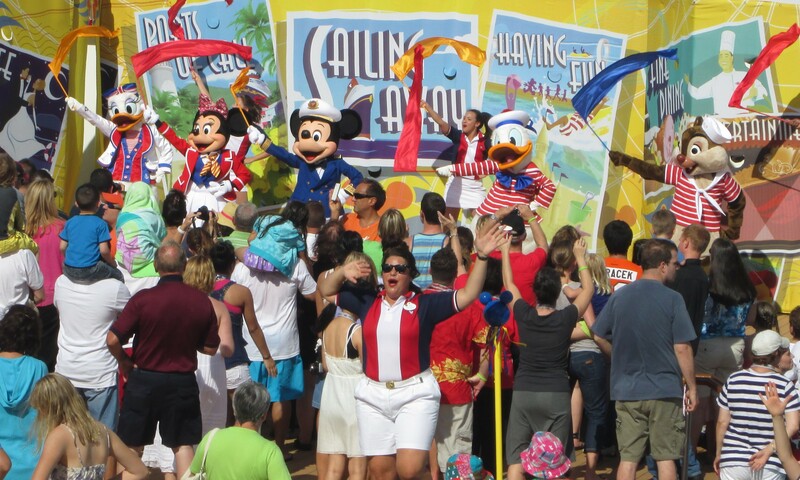 Disney Cruise Line seemed different, and doing the programming to enliven our Disney Cruise Line product heightened my interest in sailing with Mickey. My wife and I discussed taking a DCL cruise once our child was old enough to enjoy the kids’ activities, and that time has come. Conveniently enough, we’ll be sailing for TouringPlans.com on a 4-Night Bahamanian Cruise on the Disney Dream in October 2014, when my son will be about 3½ years old. Our family of three will fit fine in the smallest on-board room (Category 11C, baby! ), and I’m confident we’ll find plenty to do to fill four days. 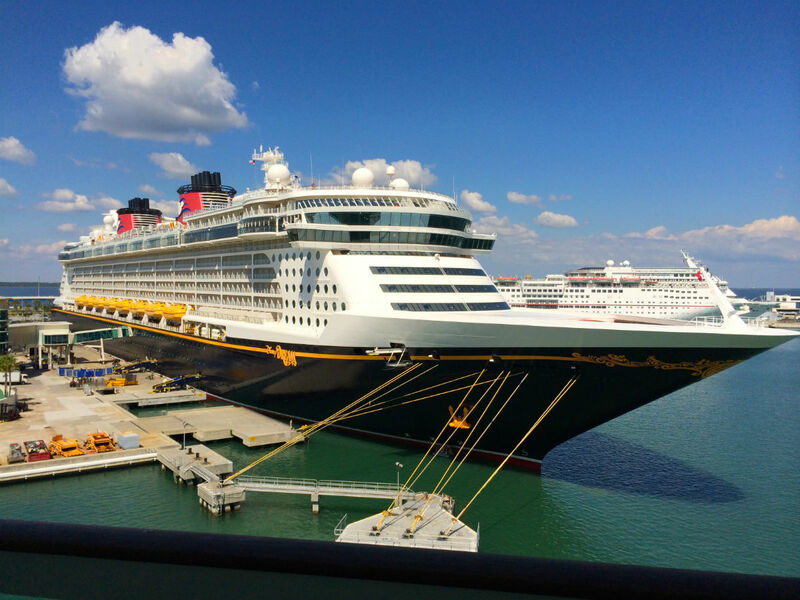 My main challenge – and most of what I’ll blog about – is getting to and from Port Canaveral in a way that works well with our schedules while minimizing costs and hassles. One recurring wrinkle in my planning is that I need to have my son in a car seat in any non-bus vehicle in which he might ride; that makes renting a car, hiring a town car, riding in a cab, etc. more burdensome. Ironically, so far I’ve found the logistics of our family trip to Tokyo in 2012 to be simpler than those for this DCL trip! I hope you’ll join with me as I analyze my transportation options and make rational decisions based on my group’s preferences and the cost impacts of our decisions. I start with a brief overview of some travel decisions I need to make. In subsequent blog posts I’ll look at TouringPlans.com tools and consult you, Dear Readers, for assistance. Decision 1: Fly or Drive? I live 800 miles away from Port Canaveral, and that’s a full day’s drive of about 11 hours each way. Flying would take less time, and that’s potentially important to minimize the time my family is away from work and school. Alas, since Len has yet to pull the trigger on a TouringPlans.com Gulfstream G650 (no Club 33 membership, either! ), I have to fly commercial, which has its own time-consuming hassles: after dealing with driving to the airport, parking, security, and local transportation (whether it be mass transit or a rental car) in Florida, that’s at least a half-a-day each way. I have to compare driving costs to three plane tickets, thee port transfers, etc., plus any hassles related to my kid’s car seat. Decision 2: When to Arrive at the Port? We recommend getting on the ship either early or late to avoid the worst crowds. Never having been on a cruise ship, I’d enjoy having all the time I can on the boat. However, I will not know my boarding time until I do online check-in 75 days before sailing, and I would have to use something other than Disney transportation to arrive in time to take advantage of that. Plus, I’m concerned that hauling around a “day bag” of stuff on the ship would be annoying. Decision 3: When to Arrive and Leave? I do not plan to arrive in Central Florida much before the cruise. We recommend arriving the day before the ship sails. That seems reasonable, but it adds an extra hotel night in unfamiliar turf for me. Plus, I’d have one fewer stopover if I flew in on the day my cruise departed and went directly to the port. After the cruise, it’d be easiest to head straight to the airport and fly home on Thursday, but I may stick around through the weekend and visit Walt Disney World. While fun (I’d get to experience the Seven Dwarfs Mine Train for the first time! ), spending time at Disney World would involve significant extra costs (hotel, food, and park tickets) for only a couple of days. Decision 4: Where to Stay Before the Cruise? Assuming I arrive the day before the cruise, I could stay near the airport, at Disney World, or near Port Canaveral. I don’t think I’ll spend the night at Disney World the night before the cruise since that would involve extra travel in the wrong direction. My preferences for the other locations will vary based on the sort of transportation I’m taking to the port. Decision 5: How to Get to the Port? I have three options here: Disney transportation, a private car service, or a car I drive. Using Disney transfers is straightforward but inflexible. A private car service is flexible but expensive. A rental car is flexible and affordable but time-consuming to deal with (especially since I have a kid who needs a car seat). If I opt to drive to Florida, this is a moot question, although I would need to decide where to park during the cruise. Look for future blog posts that walk through the above decisions, hopefully culminating in a comprehensive travel plan that works best for my family. Ultimately I’ll start worrying about what to do on the cruise (although I cannot reserve any cruise experiences until July: I have a reservation reminder set for that! ), but first I need to get to the port! We are choosing to drive from Houston for our Disney Cruise in June. As a family of five, for the cost of airfare we can add a few days of fun in Orlando and extend our 4 night cruise into a full week vacation. Did you know that some port hotels offer parking packages with transportation to and from the port? We are staying at the Country Inn and Suites the night before our cruise and leaving our car there for the duration of the cruise. The one night at the hotel plus the parking deal makes it a great value. Plus, we will have a nice, hot breakfast before we head over to the port. Good luck in making your transportation plans! Another option (which my wife and I will use April 2015) is staying at the Hyatt Regency at the airport the night before the cruise. Due to their relationship with Disney, you can have your bags picked up from the hotel and delivered directly to your cruise ship, no fuss and no muss. You can use the Disney transfer, be at the port plenty early, and your bags just magically arrive. The Hyatt isn’t an inexpensive choice (though there are ways to deal with that), but it’s definitely a super-convenient one. We’re going on our first DCL cruise in October too. And we’re a family of three too, although I have a tall six year old so we could get by without a booster seat. We’re from Chicago so we decided to fly in the day before and attend MNSSHP the night before departure. We’re DVC so our hotel costs are sunk. We still need to decide how to get to the port. As you said, Disney transportation is straightforward but inflexible. I’m guessing we wouldn’t be able to board early? We’re considering renting a car but still discerning if this is our best option vs. Disney transport. I will be first time cruising at the end of this year (very similar plan as you – except I KNOW I will be doing Disneyworld!) so I am quite excited to see your series. I just subscribed to the TP DCL – and pretty frustrated as I feel like some stuff is glossed over that a first timer like me wants more detail about. Can’t wait! Hey May – thanks for subscribing. What information would you like to see expanded on the DCL part of the site? If you fly, then rent a car to drive to port. Usually run about the same price as transfers for 2, but so much extra flexibility. You can save money by staying at a hotel off Disney property and stop by grocery store to buy any alcoholic beverages you want to bring onboard. Also, flying in day before relieves soooo much stress. Definitely worth it. About #5: A private car won’t be much more than Disney transportation to the port. Unlike the free Magical Express service for resort guests, Disney transportation to the port is $70 per person. That’s $210 for your family. You can get a town car service for around $225. The cost of the Disney transportation to Port Canaveral is $35 per person the one way. It is $70 per person round trip. Cruising for the first time in a week and can’t wait! We actually found a good hotel in Cape Canaveral that offers a “cruise and park” package that allows you to park at the hotel the length of your cruise (for free) and they have free shuttles to take you to port. You save on parking at the port and get the free transportation to/from port! Hate to break it to you, but the ONLY one of those that’s missing on a Disney Cruise are the Casinos (and that’s only on the ship, you can still gamble in some of the ports of call. That said, quality on Disney feels higher, and no one is saying you have to do any of those things anyway, it’s always your choice. Have a great time on your cruise! I’m aware that Disney has most of the usual cruise “stuff.” I may be wrong, but my sense is that–as a Disney Parks fan–the entertainment and general environment on Disney ships will appeal to me more than what’s offered on other lines. I guess I’ll find out! So everybody knows, I’ll be addressing specifics (hotel locations, stay-and-cruise deals, transportation costs, luggage transfers, etc.) in later posts, and at that time I’ll look at specific time, cost, and hassle considerations. Thanks for the suggestions! In those posts, I’ll also reveal some of the personal preferences (most of which are irrational, according to my wife) that influence my decisions. The car seat dilemma is a tricky one. After lots of research we decided not to bring a car seat with us for our three year old on our Alaskan Disney Cruise because we didn’t want to have to lug it around and store it in our tiny cabin. But it was tricky to figure out all the other transportation both getting to the ship and on excursions. (We took trains, subway, and had to pay extra to rent a car seat when we rented a car). We ended up having to take a short unexpected cab ride sans car seat in Vancouver – tried to call a cab that had a car seat but they kind of laughed at us and said it wasn’t illegal not to have one in a cab (but made me very nervous). In retrospect, it might have been easier to just take it with us! As far as arriving the day of, I would never recommend it. 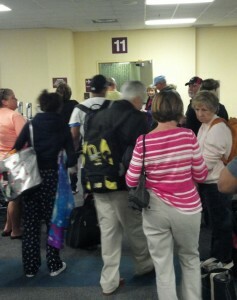 We’ve had family members miss a cruise due to flights and it was not fun for them and $$$$. Arriving the day of my last cruise (our Honeymoon) was the single most nerve-wracking part of that trip, and bear in mind that I was planning a wedding leading up to that. Our airline moved our flight from being a red-eye and wasn’t planning to tell us until 30 days prior. Luckily I caught the change and was able to get us another flight and connection that got us to the port on time. Get there the day before. It’s just not worth the hassle, aggravation, and the potential for a ruined vacation. We always used my son’s carseat on the plane until he was about four. It helps to raise them up where they can see out the window better. And we always rent a car so we would need it anyway. There is a new type of five-point harness that can be used on planes and as a regular carseat as well. It doesn’t take up much more room than a jacket would. We took our fourth cruise just last week and had a wonderful time. One thing that I forgot about was a magnetic decoration for the cabin door, and I was kicking myself. It’s hard to remember (and find) your cabin sometimes, at least for me. This would have been a big help, and lots of doors had them. So don’t forget to pack something (even one of those magnet stickers that would go on the back of a car) to make your door stand out for you! Depending on the direction away from Orlando your 800 miles are, have you already considered the Auto Train in item #1? It may not make sense for you, but if you’re in the vicinity I’d recommend looking into that. (And if you already have, might want to mention that in the post. ) I think lots of folks may not be aware of the train as an option. It solves the car seat dilemma while also providing a lot of the benefits of flying. (Relax & ride.) Cost-wise it’ll end up more expensive than flying if you choose a sleeper car, which you’d probably want with a small child. We’re in the DC metro area and the auto train has become our main mode of WDW transport. Love it! One thing I would never do again is rent a car at Orlando airport, drive to the rental car return near port canaveral (we did stay overnight in Orlando) and rely on their transportation to the ship and then back to the rental car place upon return to try and get a (reserved) car and make our flight that same day. Add trying to get car seats from the rental company in the mix…they have very limited supply! Incredibly stressful. We live close enough now to drive, so did prepaid parking online at the port a couple of weeks ago and wow what a smooth experience! And packing was easier, too, since I wasn’t worried about how much we tried to bring! I.e., our own masks/snorkels for Castaway Cay. For a day bag, we just bring a small rolling bag with medications, most precious stuffed animal, swimsuits, hats and sunscreen. Board the ship, have lunch…by then we can get into our cabin, change, leave the bag and go play. It’s not like you’re hauling a bag around for hours and hours. Come back, get showers, and by then your checked bags are there! And dropping our bags before entering the parking garage right next door is easy as pie. We brought boostapaks in the UK for our trip to Florida, they are booster seats and backpacks in one. They are a little heavy for a child to carry with all their stuff in but a great idea. About £35 each and come in black with either green trim or pink. We are trying the Baltic Disney cruise next summer, the first ever cruise for all 9 of us, can’t wait to see your tips.